The 'wave' cue is an adorable and fun cue to teach your dog. It is a relatively simple cue that can be taught simply by catching your dog in the behavior. 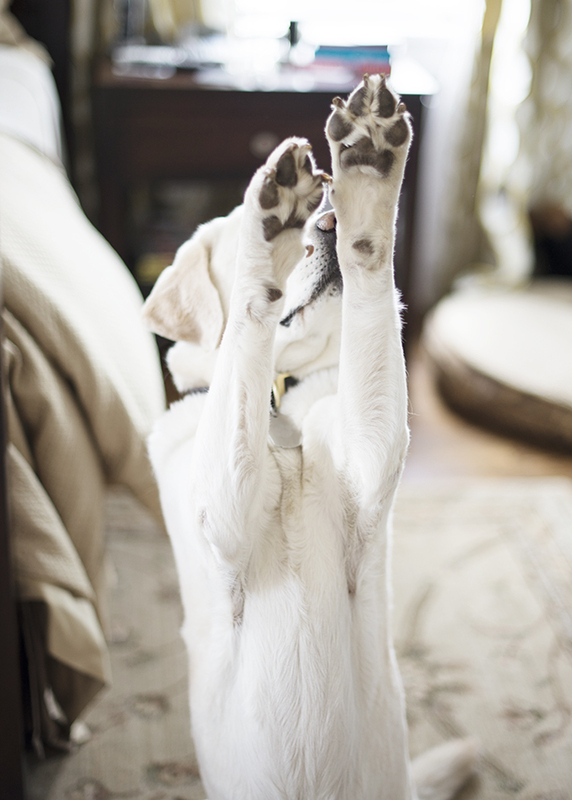 It is important that your dog is comfortable with the 'sit ' and 'stay' cues before teaching the 'wave ' cue. It may also be helpful to teach your dog to 'shake' or 'high five' before teaching the wave. Place your hand in front of your dog and ask for his paw. Mark the behavior with a 'yes!' immediately after he gives you his paw. Repeat this several times. Take a step back and put your hand towards him again. Reward him for any motion of his paw towards you, as long as his bottom stays on the ground. Repeat this until he is comfortable offering you his paw from a slight distance. Fade out the use of your hand by removing it quickly. Your dog should be swiping the air. Your dog should start to make the connection and swipe the air at the appearance of your hand. At this point, you can add in the 'wave ' verbal cue. Gradually change your hand signal from an outstretched hand to an actual waving cue. Now when you wave at your dog and ask him to 'wave ' he should pick up his paw and wave back at you.